This map shows the location of the volcanoes we use in the game, relative to the world’s tectonic plates. We have also indicated the direction of motion of the plates. Where the volcano is near a zone where the two plates are moving towards one another this is because one is moving underneath the other. Melt is generated at depth and can rise to the surface to produce ‘subduction-related’ volcanoes. When the plates are moving apart the magma wells up into the crest, adding new material. The third type occurs when there is a zone of anomalous melting in the middle of the plates. These are called ‘intra-plate’ volcanoes, you may also see them referred to as ‘hot spot’ volcanoes. Very few volcanoes on land are generated by rifting processes (the magma usually oozes up quietly, unseen, at the bottom of our oceans). 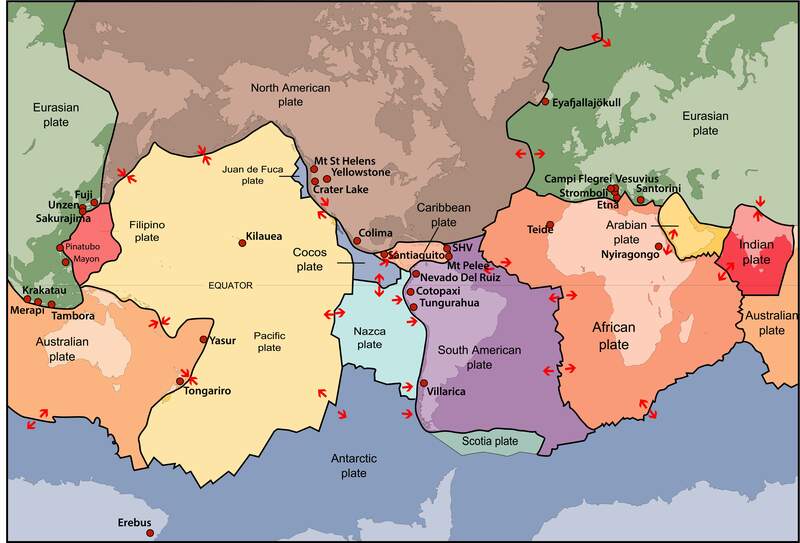 The majority of our volcanoes are in different subduction zones, but some are associated with intra-plate settings. The Smithsonian Institution Global Volcanism Program has a fantastic, free, downloadable and printable map and accompanying diagrams that detail the volcanoes of the world, complete with cross-sections of typical tectonic settings. You can find their ‘Dynamic Planet’ resource here. Intra-plate volcanoes: Kilauea, Teide, and Erebus. The distribution of our volcanoes roughly reflects their distribution worldwide, with a slight European bias! Indonesia is the country with the most active volcanoes in the world, and so we have several Indonesian volcanoes. Globally there are > 1,500 active volcanoes worldwide.